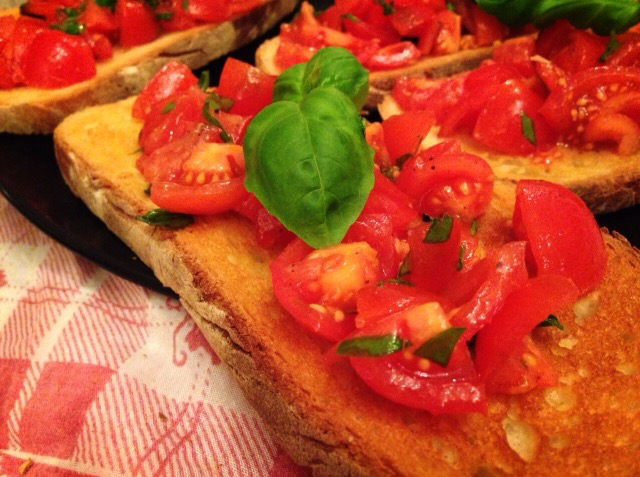 Bruschetta pronounced “Brusketta” is without a doubt one of the most popular Italian dishes throughout the world. It’s usually considered to be an antipasto “appetizer” but you can even have it as a main course like I did last night. I had one of those BIG Italian lunches yesterday and wanted something light for dinner, so my husband Marco made Bruschetta for us. Such a treat marrying an Italian man who can cook! Marco is the Chef at home! Not I.. It’s quite the contrary in most Italian homes.. Usually the wife or mamma is the one who prepares and cooks all of the meals for the family.. Well, I got lucky. What can I say? And just to let you all know, all of the dishes on Inspired in Italy, have been made by Marco. Marco is currently working on his first cookbook as I type. So, stay tuned for that! I am quite excited about it. 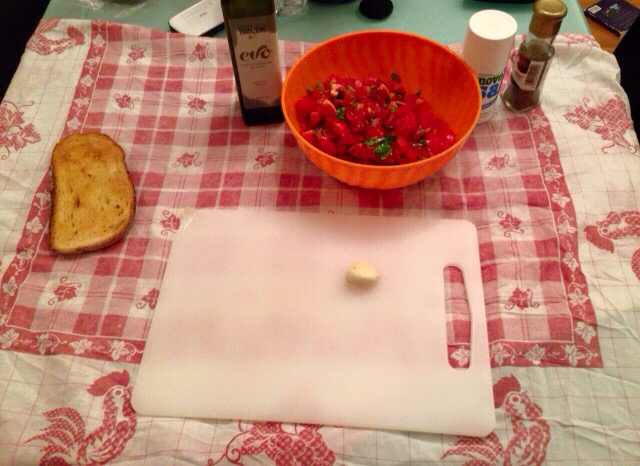 Ok, so I took some photos and videos on how to make Bruschetta. Tomatoes ~ We used Cherry tomatoes and you can use as much as you’d like.. 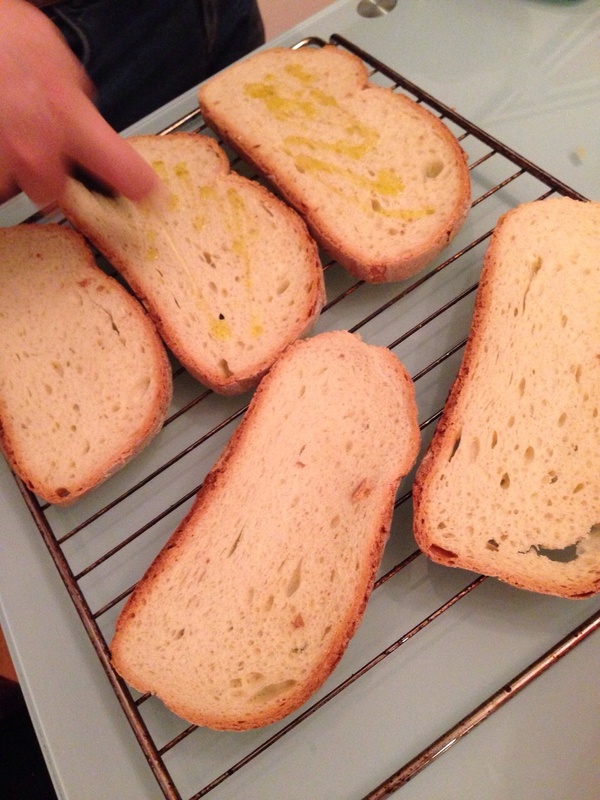 Bread ~ We used a type of bread from Puglia, but if you can’t find, you can use a french baguette or an Italian bread. Fresh Basil ~ DON’T use dried herbs!! You won’t get the same taste or flavor. How much you want to add is totally up to you. Garlic ~ We used 3 gloves of garlic. 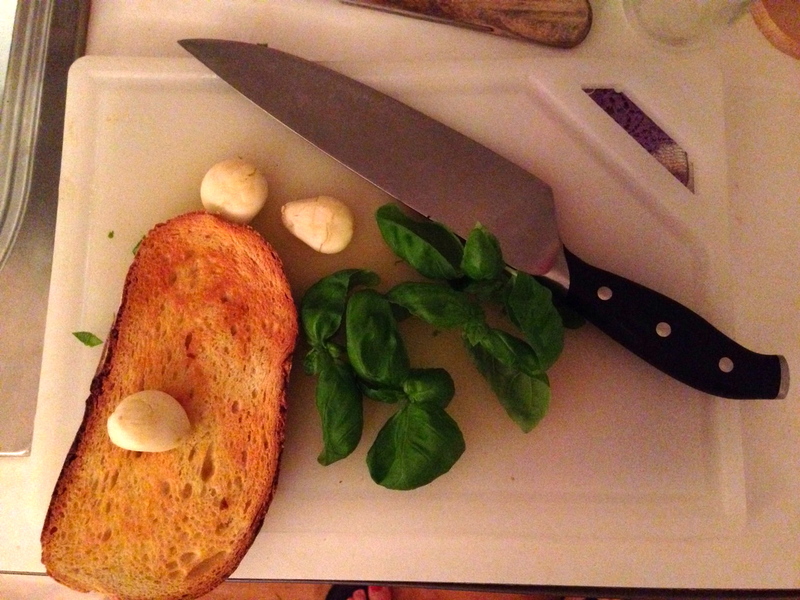 The garlic is only used to rub on the toasted bread. Salt, Pepper, AND Olive oil to taste. We used this Olive Oil from Puglia and it was amazingly good! And guess what, they ship worldwide! So, if you’d like to purchase a bottle and are not in Italy, don’t worry, you can get it at your doorstep without a problem. I highly recommend that you do. Nothing beats Olive Oil from Puglia. 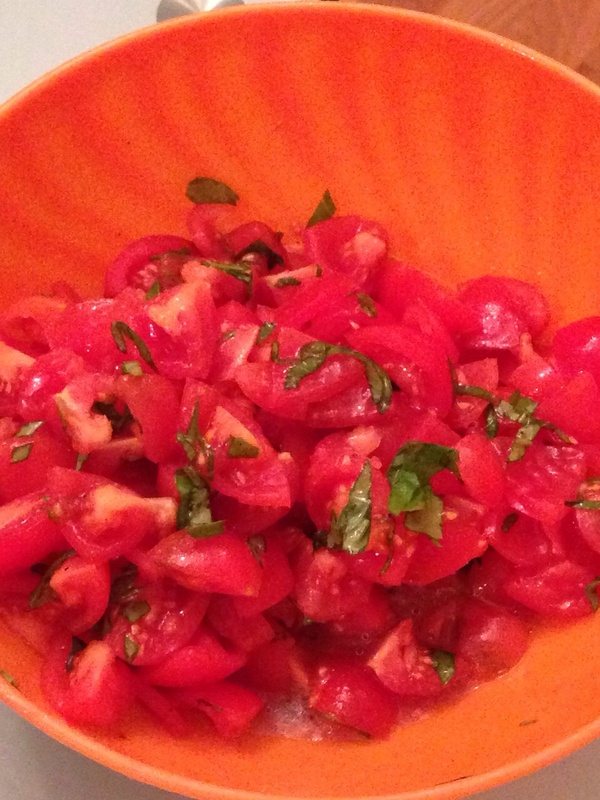 Chopped Cherry Tomatoes and Freshly chopped basil. 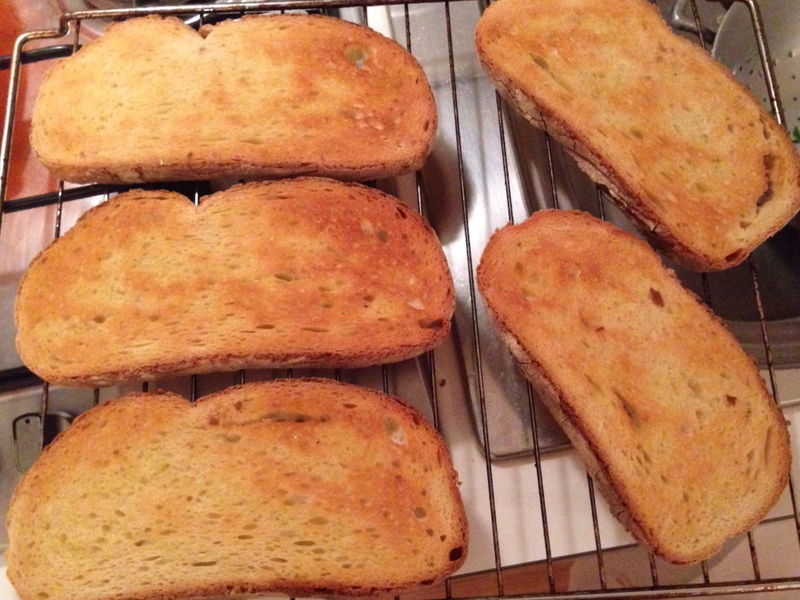 Before putting the bread in the oven, drizzle Olive Oil on each slice. This is how you want your bread to look. A nice golden color. 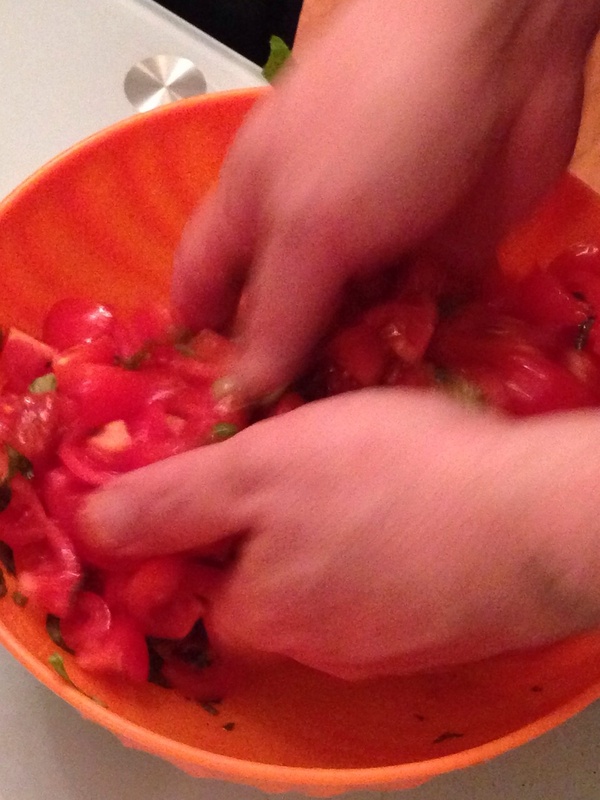 While the bread is cooling slightly, mix the tomatoes, basil, olive oil, salt and pepper together with your hands. Put aside. Time to make the Bruschetta now..
Ok, so I took a video of Marco making the bruschetta BUT I can’t figure out how to post it on here. Perhaps, I need to upgrade my site.. So for now, I will post the video on Inspired in Italy. So please go and check it out! 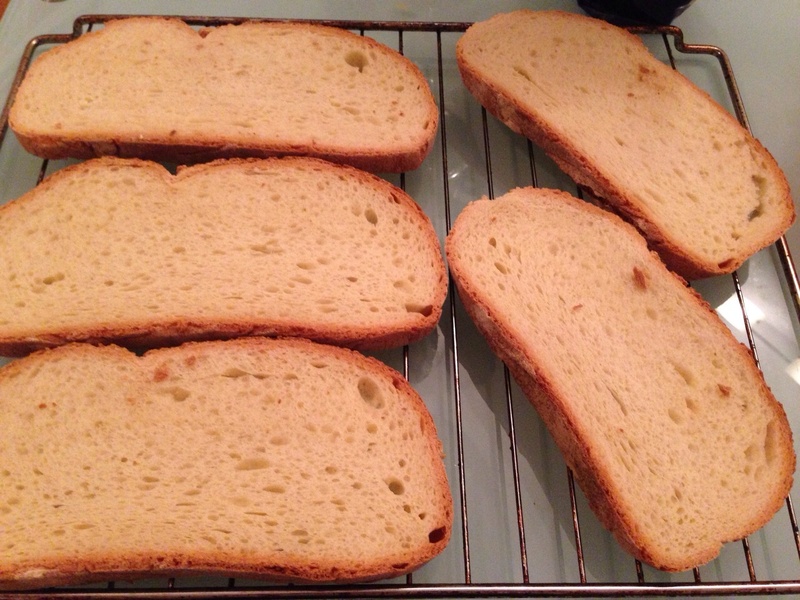 Once you take the toasted bread out of the oven, you’ll need to rub the garlic on the bread. And afterwards, you can put your tomato/basil mixture on top of the bread. Garnish with a fresh basil leaf for decoration. The video I filmed explains all of it, so please be sure to check the link out above.